Image Courtesy Wasatch Front Multiple Listing Service. 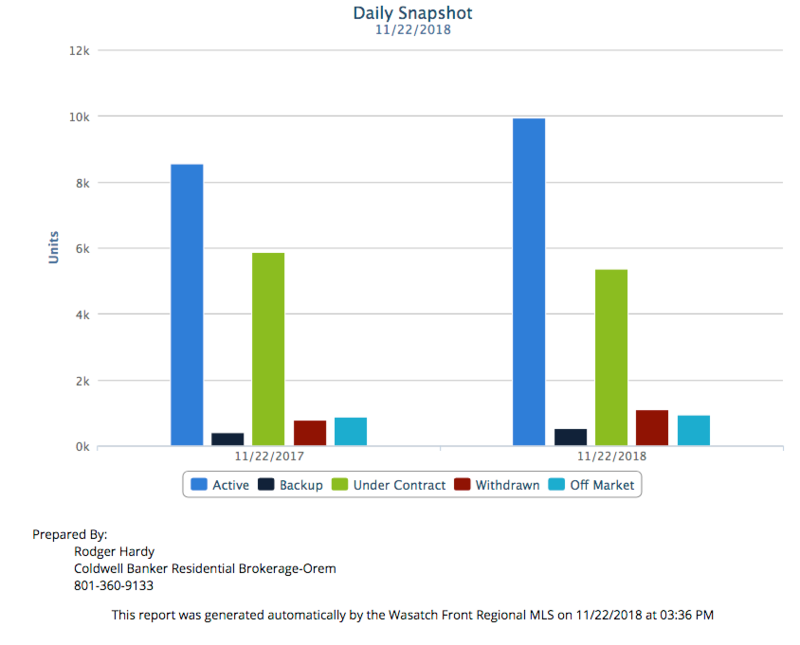 Utah County Realtors sold more single-family homes to date over the last 12 months than during the previous 12 months, according to the Wasatch Front Multiple Listing Service, despite seeing the number of sales decline when interest rates rose this fall. The total number of home sales from November last year through October was 6,617 compared with 6,542 during the previous 12 months. However, sales started falling in September with 534 sales compared with 612 sales the previous September and 525 in October, compared with 611 in October 2016. At the same time the number of homes for sale has risen and now exceeds the number of homes offered on the MLS a year ago, giving buyers more choices. Utah County seems to be better than most of the state. Sales statewide were down 7 percent in October, while Coldwell Banker Residential Brokerage sales were down just 1 percent. On the other hand, listings are up 9 percent, giving buyers more choices. Sales peaked this year in June with 705 closings, while the previous year they peaked in August with 712. However, sellers are still getting nearly their asking price for the median-sized home with 2,832 square feet, four bedrooms and three baths. Time on the market for the median home sale is now 30 days, just a tad longer than the last couple of months, but about twice as long as summer sales. While the market is showing signs of slowing, it’s still a sellers market with less than four months of inventory. Six month’s inventory is considered a normal market. We’re seeing more price reductions, but multiple offers on the more popular price range — under $350,000 — are continuing. Prices rose 10 percent over the last 12 months in Utah County, but experts are predicting a much lower appreciation rate in the next few months. The medium price for a single-family home is nearly $335,000. Prices overall are not expected to fall for several years and experts say a pricing bubble doesn’t exist as it did 10 years ago. While many would-be buyers are complaining the rapid appreciation has priced them out of the market there are still a number of zero-down loan programs and grants available. Another option: rent-to-buy programs. Home Partners of America offers one such program on a national level, which is also active here in Utah County. For those who qualify, Home Partners will buy the home the buyer selects in certain areas and then rent it to them for up to five years. The client can purchase the home any time during that period or simply walk away as they would any rental. According to new guidelines released this week Home Partners is focusing on neighborhood communities within close proximity to centers of activity. The homes can be no older than 30 years (built in 1988 or newer) that are in original condition or with obsolete floor plans. The yards can be no larger than two acres and the company leaves care of the property to the renter. Homes cannot be in a 100-year flood zone. HOA dues and transfer fees must be “reasonable,” and Home Partners determines what that means. It also doesn’t buy homes where propane tanks are the primary heating source. Another option for potential Utah County buyers is either a condominium or townhome. The median price for those types of homes in October was $225,169, according to the WFMLS, up from $202,000 12 months earlier, up more than 11 percent in the last 12 months. Some 2,225 condos and townhomes were sold from Lehi to Santaquin in the last 12 months with many sellers getting their asking price or higher.